After debating for days between the pile of chocolately goodness Bruce Bogtrotter is forced to eat in Matilda, the morning cake from In the Night Kitchen, and many others, I finally settled on Snozzcumbers from The BFG. This Roald Dahl classic was definitely one of my favorite books growing up, and the Snozzcumber particularly resonated with me. Although the ones I created will definitely not look like the description of the Snozzcumber (9-12 feet long, black and white striped), I think I got the consistency and a bit of the taste down. 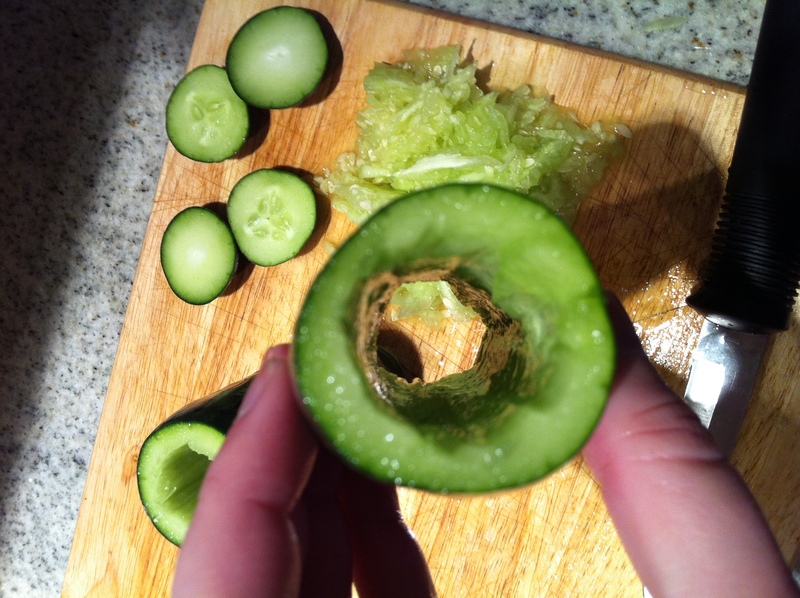 First, cut off both ends of each cucumber, and hollow them out with a small knife. 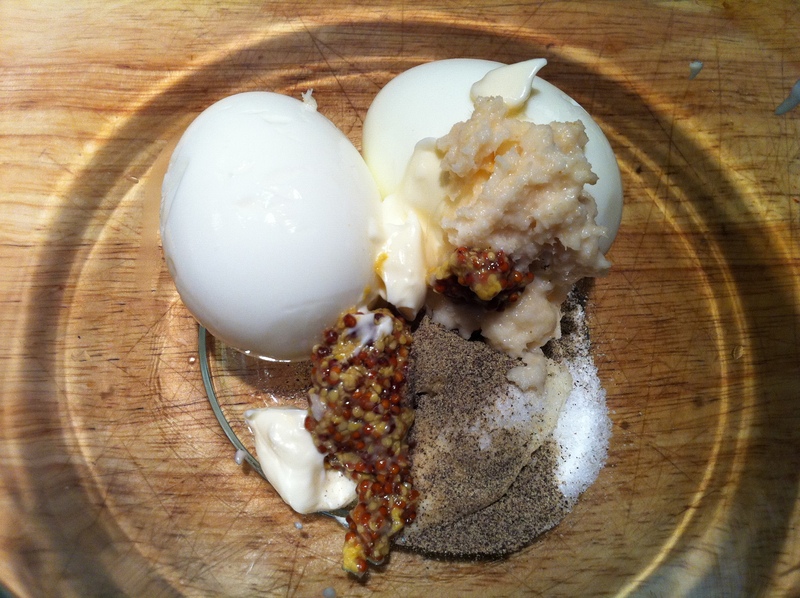 Place the eggs, mayonnaise, horseradish, and grain mustard in a small bowl. Mix together with a fork until it has an egg salad-y consistency. Add salt and pepper to taste, and then add more salt and pepper until you can hardly bear to sample it. 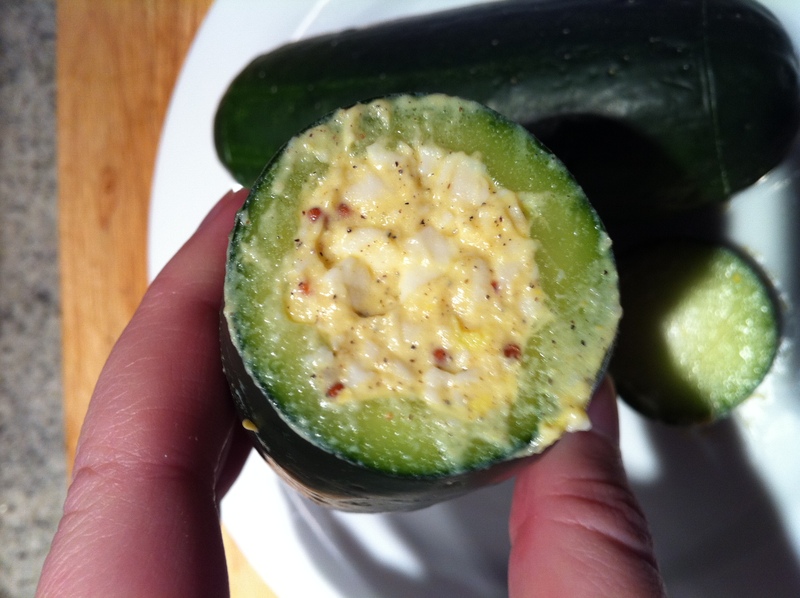 Stuff the cucumbers with the egg salad mixture and then stick their ends back on. 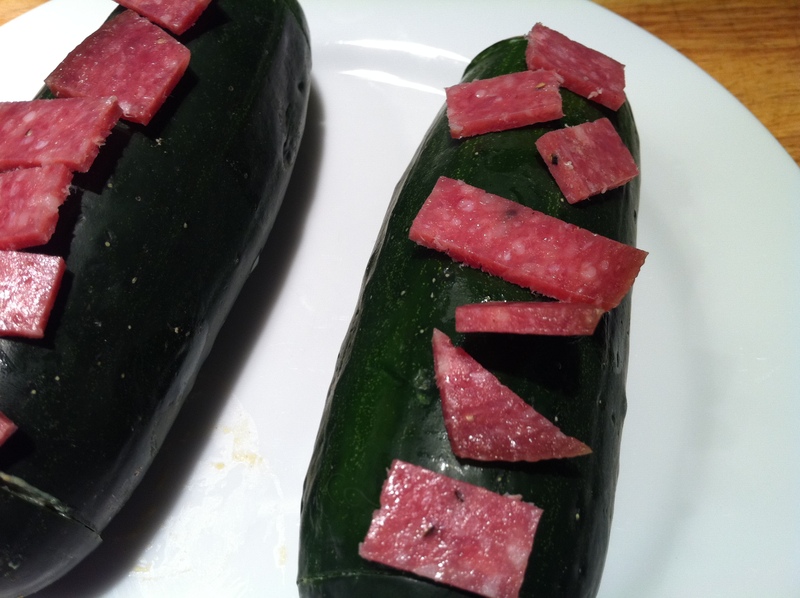 I unsuccessfully attempted to create warts out of thick-cut salami… so I gave up and just stuck bits of salami to the cucumbers so they looked especially foul and inedible. These are really vile… I may try to chop them up and stuff them in a whole wheat wrap… but that probably won’t be enough of an improvement. You never know when some life-or-death circumstance will arise when knowing how to make a Snozzcumber will impact the fate of humanity, so you’re welcome. This entry was posted in Eggs, Fictional Food and tagged cucumber, egg salad, grain mustard, horseradish, Roald Dahl, salami, Snozzcumber, The BFG. Bookmark the permalink.